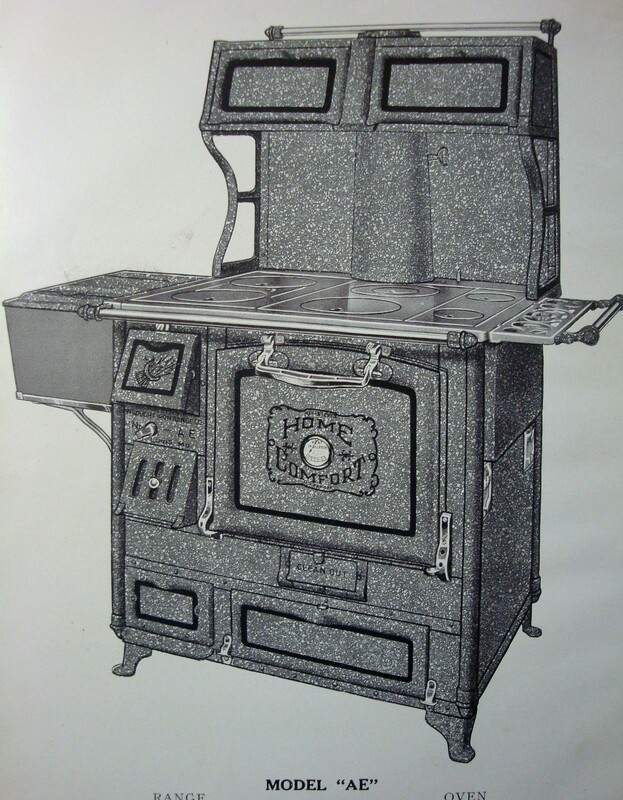 In my collection, I have the ‘Home Comfort Cook Book’, published by the manufacturer of Home Comfort Ranges, the Wrought Iron Range Co., of St. Louis, MO. The history of the ranges are detailed in the book, beginning in 1864, and feature illustrations of all of their ranges, by year of manufacture. The last illustration shows their most recent model, ‘AA’, dated 1923. A full page illustration of the ‘AE’ model was probably manufactured not long afterward. Although the book has no date, it is most likely published between 1923 and 1933. Any young woman starting a life of domestic bliss during this time period would have loved to have a Home Comfort Range, no doubt. It was state of the art. Just as, when I received my first microwave oven as a Christmas present from my mom and dad, in 1982, I was thrilled. The wonders of modern technology! Home Comfort Range Model “AE”, ca. 1923 -1933, manufactured by the Wrought Iron Range Co.
etc. Ensure that there are no openings around the stove pipe in the roof, and if there are, close them. Now, check that the fire-box and ash pan are clean and lay the fire with dry kindling or other fuel. Open the direct damper and the draft door underneath the fire door. Light the fire and after it is well started, pull the damper forward. Ensure that the oven door is closed tight and that the oven is thoroughly heated before beginning to bake (a few trials will help figure this out). Scrape the accumulated soot and ashes out of the soot door at least once a week, preferably twice. Empty the ash pan at least once a day. In extremely cold weather, empty the reservoir at night to prevent damage by freezing. Prepare chicken as for frying, salt,and boil at length until meat separates from bone (according to the cooking chart in the Home Comfort Cook Book, boiling a chicken takes from 1 to 1 and a half hours) 1 hour before serving, put fried meat fat in pan, add 1 finely cut onion, a bit of garlic and cook, but do not brown. Add 2 cups tomatoes, season with salt and pepper, cloves, cinnamon, mace, chopped parsley and chili powder. Cook 15 minutes then add to chicken. Thicken with a little corn starch and serve with rice. Other seasonings such as chopped green pepper, horseradish, lemon juice may be used, according to the materials on hand. For the rice, clean it by rinsing and place in boiling salted water for 30 – 35 minutes. Drain and let it set in the oven for enough time to drive off excess surface moisture, 10 – 15 minutes. 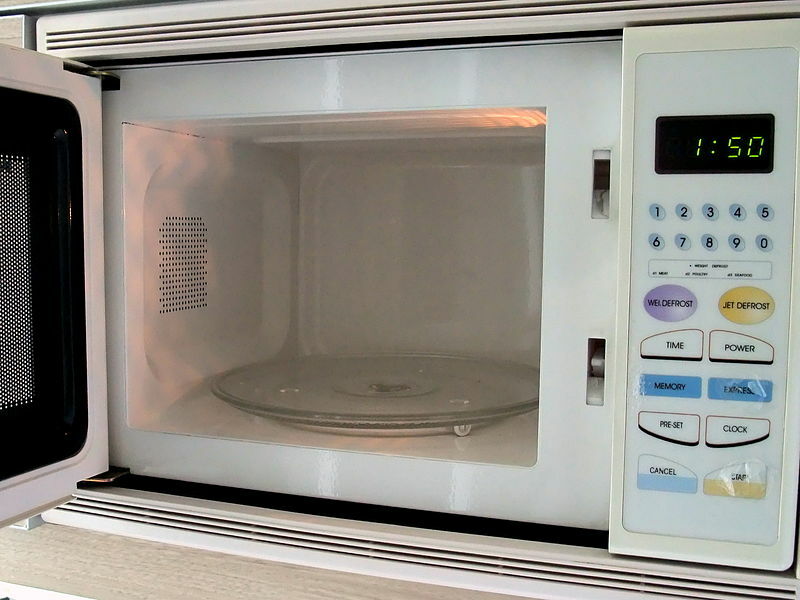 The Modern Microwave. It’s even Portable! Buy a box of Zatarain’s Chicken Creole Rice Mix. Add water, 1 can of tomatoes, butter, rice mix and pre-cut bite sized chicken pieces. Microwave on high for 5 minutes. Stir. Microwave on medium for 18 minutes. Let stand for 5 minutes and serve. If there were still ‘World’s Fairs’ in this country like there used to be, what would the 2013 World’s Fair feature in the kitchen of the future? We can only speculate! This entry was posted in Cookbooks, Cooking, Cooking and Social History, Eating, Uncategorized, Vintage Cookbooks and tagged Cook, Cookbook, cookbooks, Cooking, food history, Home Comfort Cook Book, Home Comfort Range, Microwave oven, Oven, social history, St. Louis, time capsules, Wrought Iron Range Co.. Bookmark the permalink.